Check out this new operation coming for Google from the office of Herezie in Paris. Google is investing a lot into its Google Cloud business to attract enterprise consumers and compete against Amazon Web Services who currently has a dominant market share. 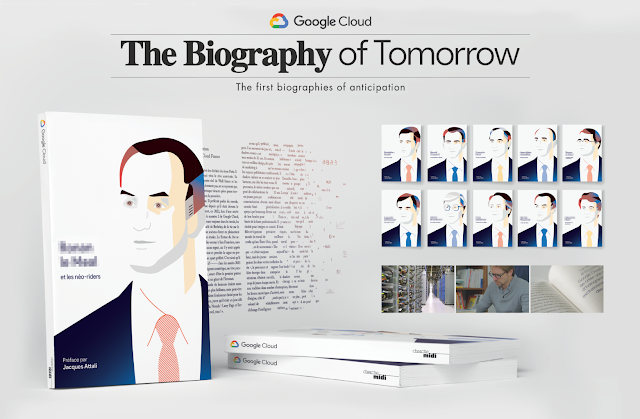 Google challenged Herezie to reach high-profile CEOs of large companies in order to introduce them to its superior cloud offering. Herezie came up with a brilliant idea that uses data in a creative way and relies on a very non-digital medium to sell a digital product: books. But not any book. A book that tells the future of your professional life. Jonathan Hadida, Head of Enterprise Marketing for Google Cloud France, notes: "Working with a publishing company was like meetings, lots of meetings. And it was very different from anything that we've ever done before at Google Cloud. Our goal was just to build a great mix of the vision that we had for these industries but also the publisher's capacity to write a story that would be a pleasure to read for anyone." A boatload of data was fed into Google Cloud that was able to predict from it what the next ten years of a CEO would look like. Herezie then teamed up with a renowed publishing house and expert ghostwriters to pen unique biographies of ten CEOs of the largest firms in the country. An esteemed economist also wrote the foreword for each book. And only one copy of each book was produced that was hand delivered to each CEO. Imagine the surprise they got when they received their future biography. That's a heck of a salespitch!